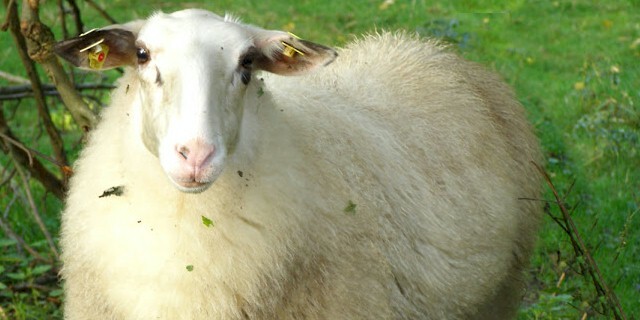 Bentheimer Landschaf (A.K.A The Landrace of Bentheim) are medium-sized German sheep. They were developed by a cross between German and Dutch heath sheep and marsh sheep. They have been bred in the northern German Emsland area since 1934, especially in the county of Bentheim. They are mainly white and have black around their ears, eyes, and legs. They have a slender body, long head and Roman nose. Their ears are small and the tail is long and woolly. Both rams and ewes are generally polled. The average body height of the mature ewes is around 67 cm at the withers, and the rams are slightly larger than the ewes. The average live body weight of the mature Bentheimer Landschaf rams is around 75 to 80 kg. And average live body weight of the mature ewes is between 50 and 60 kg. The Bentheimer Landschaf sheep breed is raised mainly for vegetation management or landscape preservation. Their average fleece production is around 3-4 kg. Their fleece is of pretty good quality with a fiber diameter of 34-40 microns. Bentheimer Landschaf ewes lamb easily, and are very good mothers. They need to live in a flock, but they are easily satisfied. Today the Bentheimer Landschaf sheep is highly endangered, and the breed is raised for landscape preservation.